I hiked this general area last year right about this time in June and had decided it was not much to look at...but here I am again. Breakfast this morning was had at Waffle House in Conway. Entry to this wilderness is a bit out of the way, to say the least. After going east on Hwy 412/62 out of Yellville you go south on Hwy 101 which eventually turns to dirt near the wilderness. There are two entry points...that I am aware of to gain access here. The first has a large parking area where horses gather to frolic in the wilderness. The second is near a 4-way crossroad. You'll know you are on the right path at this access when you walk past an antennae at the top of the hill. This hike was initiated at the crossroad access at 5:15 a.m. 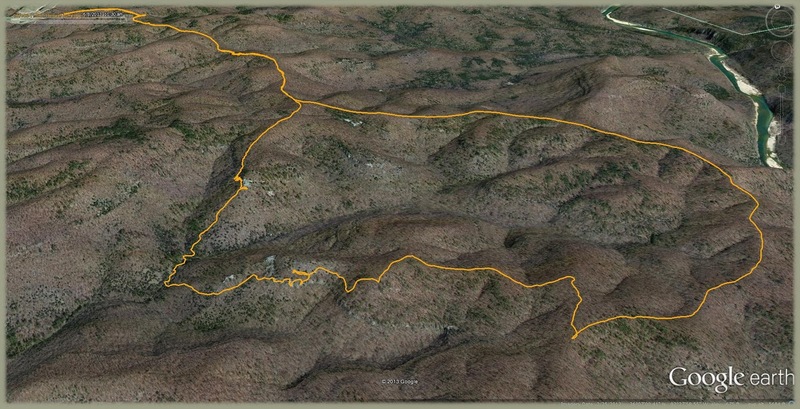 There are trails that follow old road beds all over this wilderness. Maintenance is brought to you by horses and their associated riders. My stand on horses is mixed but the trails would probably not exist without them. The morning was cool at 59 degrees and the skies were partly cloudy. A light breeze was a-blowin'. 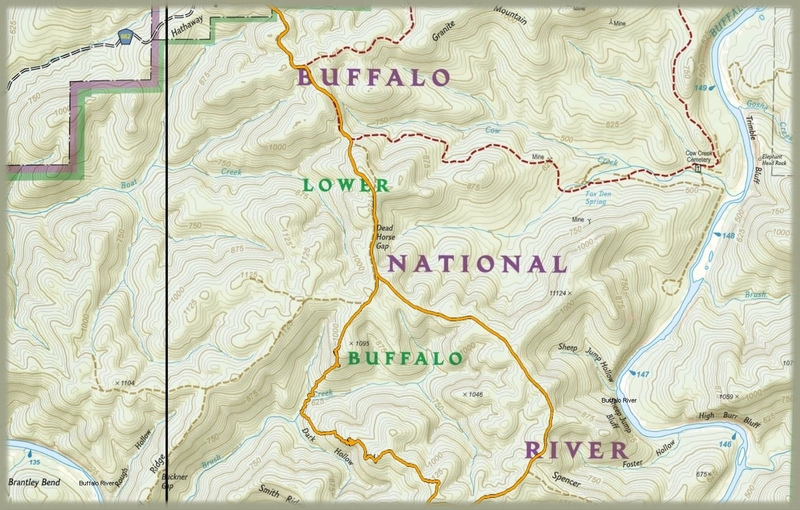 My goal was an area not too far from the Buffalo where a rocky area was spotted on the map. I had hoped to arrive there near sunrise but I was about an hour behind. The trail was easily passable. There are numerous trails that fork and go in all directions...so beware. 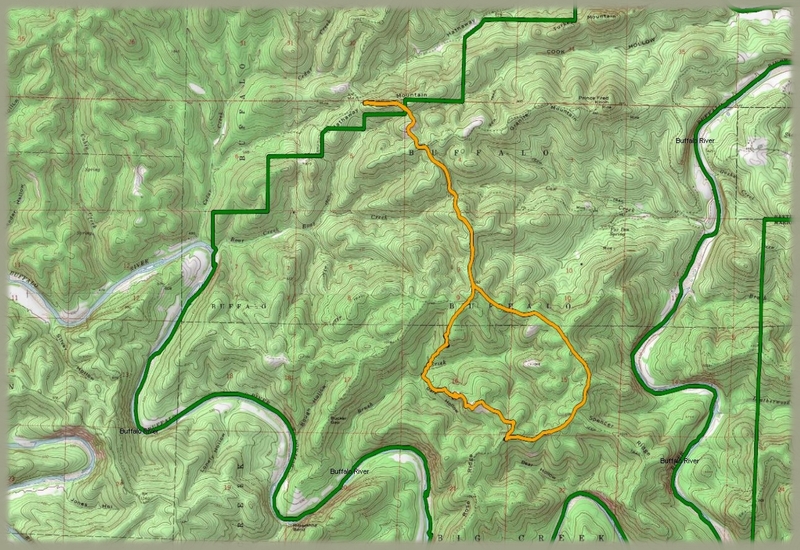 These trails follow ridges in general and there is evidence of controlled burning everywhere. The rocky outcropping above Dark Hollow was stepped upon around 7:30. There were numerous glades on top of these bluffs filled with grasses, wildflowers and prickly pear cacti. I knelt in what I assume was stinging nettle because a burning sensation consumed my knee and lower leg. I have experienced this before and it fades a way in an hour or less. My direction then turned towards the valley and a nice little bedrock creek was found flowing at the bottom. I worked my way back up to the ridge on the other side and soon connected to the original trail I followed in. There was a neat little cave in the side of a bluff that I almost crawled into but after tossing a rock inside a hissing sound was returned and I wanted no part of whatever called back. I made it back to the vehicle by 11:30 and the temp was heading above 80. This area was found to be quite curious and it might be worth more exploration in the winter months. Total hike action came to 10 miles.